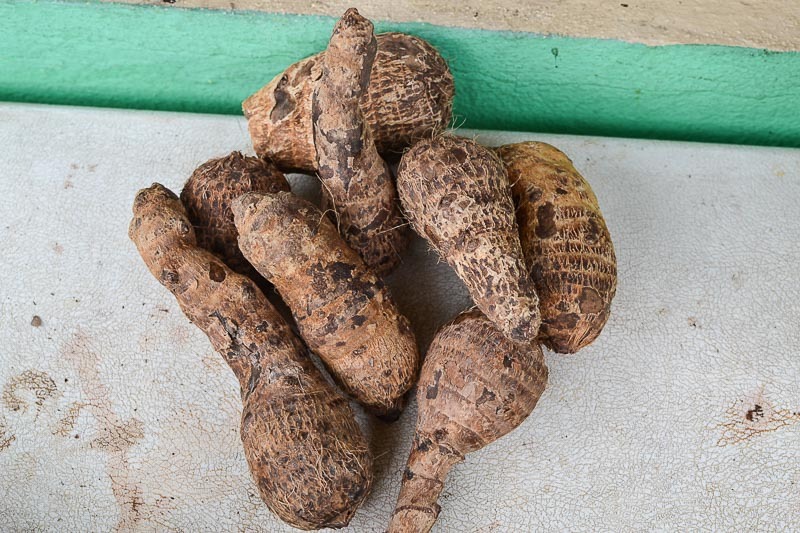 Cocoyam is a fast-growing perennial herb native to tropical America, its natural range extending from the Caribbean to northern parts of South America, where it has long been cultivated for its potato-like cormels, these being cooked and eaten as a starchy vegetable. 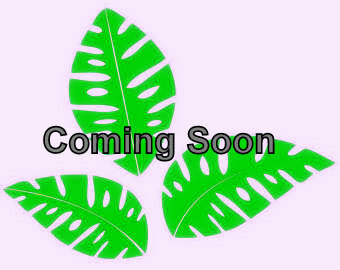 The leaves are eye-catching, dark green with a very large heart-shape, some up to 1 m (3 ft) long and nearly as wide. They sit atop pale green succulent stems growing up from a central tuber, which develops underground. The stems, which may be 1 to 2 m (3 to 6 ft) tall, are thick at the base then taper toward the leaf end. They lean away from the centre of the plant, bent outward by the weight of the leaf. Because of their large size, the leaves are either touching or overlapping, forming a dense, umbrella-like canopy. The flowers are borne on an erect, finger-like spike partly surrounded by a large, semi-circular, cream-coloured bract or spathe and sits on top of a short flower stalk at the centre of the plant and beneath the leaves. Flowers are either female or male borne separately on different parts of the spike, with the female flowers closer to the base. Though they become pollinated, they rarely produce seed. Edible cormels around the size of a large potato and elongated at one end, develop attached to the outside of the underground tuber. They have thick, rough brown skin with white flesh underneath, less commonly yellow or pink flesh, depending on the variety. When peeled the cormels can be cooked similar to potatoes, either roasted, boiled or steamed on their own, cooked in soups or stews, mashed or puréed, or they can be sliced and fried to make chips, crisps or fritters, with a flavour described as earthy and slightly nutty. The cormels can also be ground and dried to make a flour, or grated to make a starch which has use as a thickening agent. Only the cormels are eaten, not the central tuber which is unfit for human consumption. The leftover central tuber is sometimes cut into pieces, boiled and fed to pigs. The small young leaves are also edible and can be cooked and served as a leafy vegetable, similar to spinach. Cattle, sheep and goats forage the leaves, which have a reported crude protein content of 22% of their dry weight. 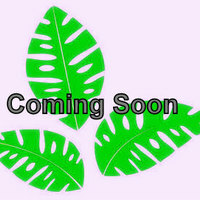 It is sometimes cultivated as an ornamental for its massive leaves, which add a lush tropical look to gardens. It grows naturally and is productive in humid subtropical and tropical lowland climates, generally in areas with annual lows of 13 to 25 °C, annual highs of 24 to 35 °C, annual rainfall of 1200 and 6000 mm and a dry season of 4 months or less. 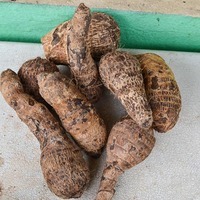 New plants are grown either from surplus cormels, sections of the central tuber, or stems with a piece of central tuber intact. Overall, growth rates and cormel yields are reported to be best when sections of the central tuber are used for planting. It performs best on free-draining, rich loam soils with a slightly acid to neutral pH, generally in the range of 5.5 to 7.0 and on sites with full sun to light shade exposure. Though known to thrive in moist soils along stream banks, it will not tolerant waterlogging. The cormels can be harvested after five months of growth and as needed up to when the plant starts to die back at around nine to ten months, usually indicated by the older leaves turning yellow. Care is taken when unearthing the cormels not to cut or bruise them as this will shorten their shelf-life, which is normally around three months when stored in a cool, dry place. Average yields of 1 to 2 kg per plant can be expected or between 10,000 and 20,000 kg per hectare per year in intensive farming systems and with yields as high as 30,000 kg per hectare having been reported. Although it rarely sets seed, tuber or cormel pieces left in the grown with grow to form new clumps of plants. It has been recorded as having escaped cultivation and as a weed of agriculture, mainly in countries in the Pacific region. All parts of the plant and especially the central tuber contain calcium oxalate, which is a gastrointestinal irritant if consumed raw or uncooked, mainly causing burning and inflammation of the mouth and throat. The plant sap may also be a skin and eye irritation to some people. Horton, D. 1988. Underground crops: long-term trends in production of roots and tubers. Winrock International, USA. Litzenberger, S. C. 1974, Guide for field crops in the tropics and the subtropics, Office of Agriculture, Technical Assistance Bureau, Agency for International Development (USAID), Washington D.C.
National Research Council (Board on Science and Technology for International Development) 1975, Underexploited tropical plants with promising economic value, National Academic Press, Washington D. C.